2017 marks the first decade of the SWITCH-Asia Programme. In the course of these 10 years, Sustainable Consumption and Production (SCP) has become a Sustainable Development Goal and was firmly established in the development agenda, adopted in 2015. Throughout the 10 years, the SWITCH-Asia Network facility has been hosted at the CSCP. Since 2007, SWITCH-Asia has been supporting 100 SCP promotion and demonstration projects across 17 Asian countries, including National and Regional Policy Support Components. Working in close coordination with an extensive network of beneficiaries and partner organisations, SWITCH-Asia has been active in multiple industries in least developed and developing countries. The experiences gathered in this decade retain a high level of potential for replication and can be scaled up across sectors and regions, as evidenced by the successive creation of partner Programmes SwitchMed and Switch Africa Green. 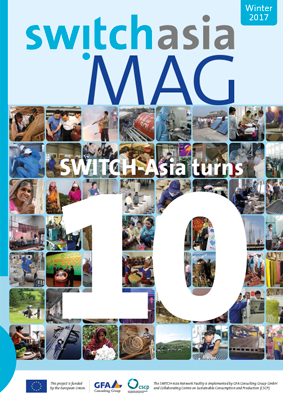 This special issue of the SWITCH-Asia Magazine provides an overview of the impact generated by the Programme in its first decade through its grant projects, highlighting milestones and outstanding success stories, from social impact to technological upgrades, from policy development to new financing solutions. It includes an extensive feature with detailed data and figures of impact, and a country report about Nepal.